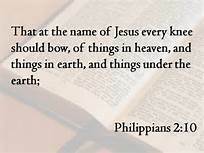 It is because of our Lords obedience who took it upon Himself to be a servant among men, and endured the cross did God exalt Him and was given a name above all names that every knee will one day bow before Him! (Philippians 2:5-12). Let this mind be in you, which was also in Christ Jesus: Who, being in the form of God, thought it not robbery to be equal with God: But made himself of no reputation, and took upon him the form of a servant, and was made in the likeness of men: And being found in fashion as a man, he humbled himself, and became obedient unto death, even the death of the cross. Wherefore God also hath highly exalted him, and given him a name which is above every name: That at the name of Jesus every knee should bow, of things in heaven, and things in earth, and things under the earth; And that every tongue should confess that Jesus Christ is Lord, to the glory of God the Father. Wherefore, my beloved, as ye have always obeyed, not as in my presence only, but now much more in my absence, work out your own salvation with fear and trembling. Jesus said He and His Father are one, and in the Old Testament do we see this truth when God tells us to look to Him and be saved for every knee will bow before Him and every tongue will swear by His truth. (Isaiah 45:20-25). Assemble yourselves and come; draw near together, ye that are escaped of the nations: they have no knowledge that set up the wood of their graven image, and pray unto a god that cannot save. Tell ye, and bring them near; yea, let them take counsel together: who hath declared this from ancient time? who hath told it from that time? have not I the Lord? and there is no God else beside me; a just God and a Saviour; there is none beside me. Look unto me, and be ye saved, all the ends of the earth: for I am God, and there is none else. I have sworn by myself, the word is gone out of my mouth in righteousness, and shall not return, That unto me every knee shall bow, every tongue shall swear. Surely, shall one say, in the Lord have I righteousness and strength: even to him shall men come; and all that are incensed against him shall be ashamed. In the Lord shall all the seed of Israel be justified, and shall glory. Although one may put themselves above another yet are we all equal in the eyes of God, each having the same chance of salvation as the next. Therefore let us not put a stumbling block before anyone, lest they fall for we all will give account to God. (Romans 14:10-13). But why dost thou judge thy brother? or why dost thou set at nought thy brother? for we shall all stand before the judgment seat of Christ. For it is written, As I live, saith the Lord, every knee shall bow to me, and every tongue shall confess to God. So then every one of us shall give account of himself to God. Let us not therefore judge one another any more: but judge this rather, that no man put a stumblingblock or an occasion to fall in his brother’s way.